Evolution favors the wolf who focuses on what matters most: finding food, remaining healthy, resting, breeding, caring for young – not confronting and dominating others. The same is true for all species. Several weeks ago, the New York Times Magazine published “Zoo Animals And Their Discontents,” an article about Dr. Vint Virga, a veterinarian and animal behaviorist who tends to the psychological welfare of animals in captivity. Virga is to zoo animals what Freud, Frankl, and Jung were to humans. So, when an animal in captivity displays anxiety, depression, phobias, obsessive-compulsive behavior and other maladies, Virga is called in to diagnose and treat the afflicted animal. 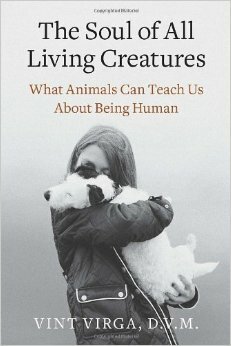 The article led me to read Virga’s recently published book “The Soul of All Living Creatures” What Animals Can Teach Us About Being Human, a 217-page, 10-chapter book which is fascinating for its insights into animal behavior and how closely those behaviors mirror our own. Each chapter takes a topic – Connection, Sensitivity, Mindfulness, Responsiveness, Expressivity, Adaptability, Integrity, Forgiveness, Presence, and What Lies Beneath – that affects both animals and humans. Although at first, the organization sounds like a self-help book, there is so much more to this book for readers who take the time to read and absorb Virga’s message. Very few people would dispute that animals have feelings. Consider a mother who cares and protects her cubs, a dog who wags his tail when he sees his person, an elephant grieving, or a lion in distress in the confines of a zoo. Virga asserts that animals communicate and that we, as their keepers, have much to learn but don’t listen because we don’t know how. We need to observe, be mindful, and open. Virga also asserts that if we applied some of the same principles to our own lives that animals apply to their lives, our world would be more meaningful. For instance, animals perceive with awareness and act with intention. Although past experiences affect them, animals for the most part live in the moment for their very survival more often that not, depends on this. This is not to say we shouldn’t engage in reflection; we need to but at the same time we should not allow the past to stop us from living in the moment. Animals by their nature do not restrict their lives by choice. Yet humans do – in countless ways – with animals, others, as well as ourselves. We have few, if any captors or keepers, although we act as if we do. Every day we put ourselves in boxes, denying ourselves the things that matter most to us…When we take the time to step back a moment and look at our priorities – those parts of our live and daily routines that mean the very most to us – we can see where our lives are out of balance and adjust them to living with integrity. We begin by noticing and caring for every part of the whole. At the core of The Soul of All Living Creatures is the belief that all living creatures, animals and humans are unique and individual beings – an idea that even detractors must consider after reading Virga’s message. Winner of the Nautilus Book Award which recognizes and rewards world-changing books and celebrates how they contribute to positive social change, The Soul of All Living Creatures will forever change how you look at zoos, your pets, yourself, and others.